The IBM Watson computing technology, which has helped organize massive data and has beaten champions on the “Jeopardy” TV show, is now learning Japanese. IBM Watson, a unit of the U.S. technology and consulting company, said Thursday it was working with telecommunications and robotics company Softbank Corp. to share Watson with startups and universities in Japan for a variety of consumer applications, starting in October. Watson Senior Vice President Mike Rhodin told reporters that Watson, a cloud-based technology, is an effective tool in handling a large amount of unstructured data, such as clinical tests, information on drugs and regulations in the legal field. Since such information and knowledge has grown so enormous, and is constantly updated, no human can hope to keep up, he said. That is where Watson can help. Watson has also proved effective in education, such as online classes and advising teachers. It can also help decide optimal travel plans, juggling options on hotels and flights. One example of a new partnership is with the University of Tokyo, which will use IBM’s Watson Genomic Analytics technology, a cognitive computing system, to discover new cancer treatment options based on gene mutations — the first organization outside North America to use Watson Genomic Analytics. Watson already knows English, has acquired Spanish, French and Portuguese, and is set to learn Arabic next. IBM’s clients in Japan so far have been mostly business clients. Softbank, which also has a telecommunications business, was chosen as a partner to reach startups and consumers. 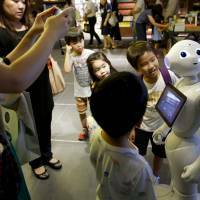 The company showed a video in which Softbank’s humanoid robot Pepper was a sales clerk at a Japanese electronics store. 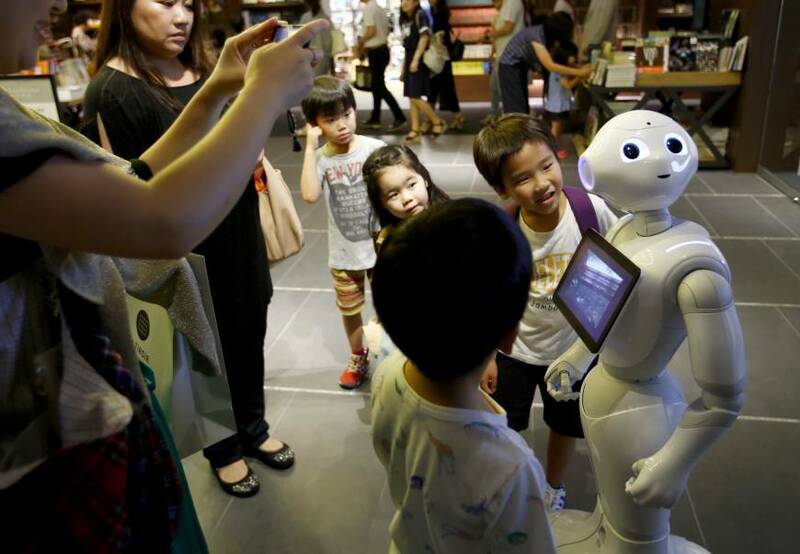 Pepper has cameras, sensors and voice recognition to simulate an emotional interaction with people. In the video, when the shopper asked, “What’s good about a 4K TV?” Pepper used Watson to go into a database and give a rundown on its advantages. Rhodin said the world was undergoing an “information revolution,” flooded with newly generated computer data plus information from social media, including video, and what is coming from Internet-connected sensors and devices.